At Allstate Construction Roofing, our roofers are always ready to go at a moment's notice with the equipment and expertise needed to quickly and effectively repair all types of roof leaks and roofing damage. As one of Florida's leading roofing companies, our roofing crews are well versed in all types of roofing materials and can solve any problem you may have. If you have a roof emergency or need any of our other roofing services, call us at 1-844-509-5522 or click below for a free inspection! Flashing failures at roof penetrations, including lead pipes, goosenecks, and ridge vents. Some roofing emergencies are preventable, but others are simply out of the homeowner's control. Homeowners should always take care to have proper roof maintenance and practice preventative strategies. 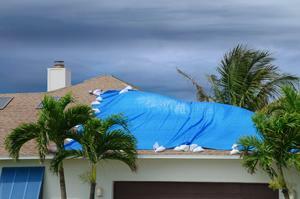 As an experienced roofing contractor in Florida, we can handle any emergency roof repair need you may have. If your home has leaks, wind damage, or a collapsing roof, make us your first call to get fast, effective repairs. Call us today for a free inspection on any of our roofing services! We work throughout Miami, Bonita Springs, The Panhandle, Orlando, Port St. Lucie, Cape Coral, Fort Myers, Fort Myers Beach, Estero, North Fort Myers and the surrounding areas.